I thought you’d also enjoy this modern day version of a Thoreau cabin. No amenities just pure and simple. A micro cabin to sleep and write in. Personally I’d love to spend some time with myself in something like this. Maybe even use that time to write, reflect and plan. How about you? This would also be really cool to have in your current backyard if you’re allowed to. It’s pretty stealthy too. Looks like a tiny barn shed for storage. 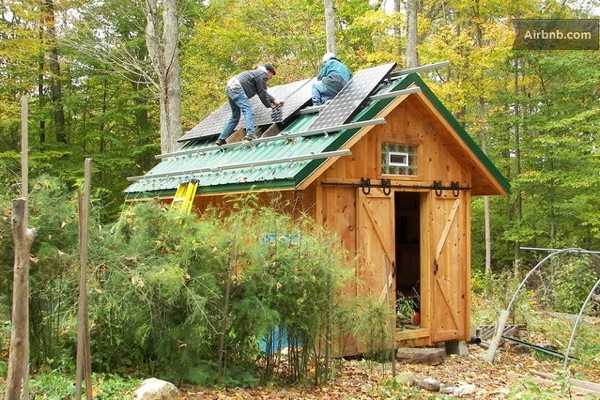 More info on this modern day solar cabin here. If you enjoyed this modern day solar Thoreau cabin “Like” and share using the social buttons below then tell us your favorite part about it in the comments and join our free daily tiny house newsletter if you already haven’t. Thanks! Previous Post:Simple Living in an Off Grid Micro Cabin? Yes! I love this simple. As a writer, i see how magical it could be to work there. I like all the exposed interior wood. Me too 🙂 Thanks Greg! Im lost… if no ammenities…. why so many solar panels? Theres like 3kW on panels in there…..